We noticed during shearing yesterday that Griselle and Zelda are losing more weight, too much to be healthy. We found that Zelda has lost all of her front teeth and is probably having trouble chewing and grinding the hay. Giselle is very old, and she has always looked kind of emaciated, she was a very neglected and abandoned animal, her wool had felted when she came, she hadn’t been sheared in years. But she is declining visibly, like Zelda. We are talking about putting Zelda down in the fall so that she doesn’t have to endure another winter. She is often alone and lying down by herself, always a sign of trouble with sheep. And winters can be brutal on animals losing their weight and fat. She is probably about 12 years old, she is a far cry from the feisty and rebellious animal who knocked me down many times and jumped many fences. Many animal lovers define mercy as keeping an animal alive by all means at any cost. To them, that is what love means. I have learned to define it differently. To me, and to Maria also, mercy means sometimes letting go, and ending suffering, as we did with Rocky, our 34-year-old pony as he faced another brutal upstate winter. Sometimes, you love the most by letting go. This is something every person with a farm knows, but many pet lovers do not know. So we may spare Zelda another winter, depending on how she is. In the meantime, we are getting her and Griselle into the Pole Barn for some daily grain feedings. This should fatten both of them up, grain is easy for them to swallow and grind and digest, and should also give them both more energy. 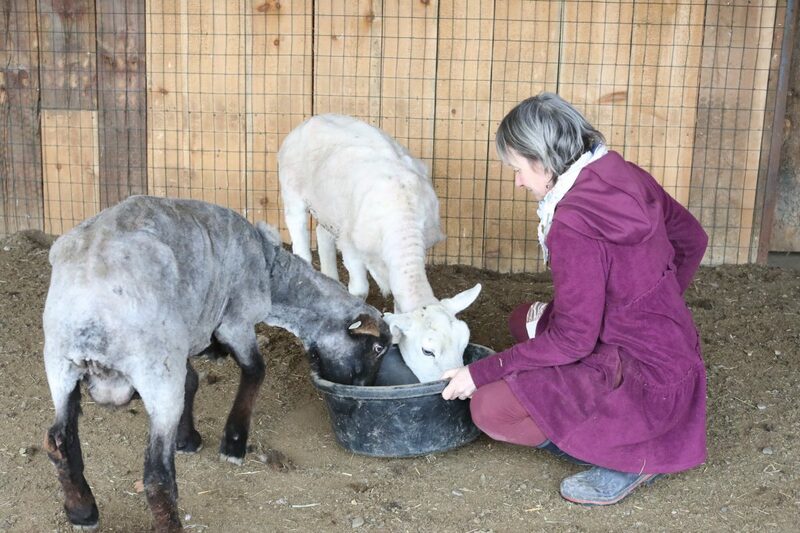 Red has slowed down a lot, and getting the sheep into the barn is easy – we shake a grain bucket – getting everybody but Zelda and Giselle out is the hard part. It was quite brawl today but we did it. It can get rough in there, the trick is to get most of them out and slamming the gate at the right moment. Very easy to get knocked down, and sheep go for the knees. Bud wanted no part of it, and Fate is enthusiastic but useless. Red just can’t move fast enough any longer. I am a herding dog now. c’est la vie. I hope that, when my health is bad, and my teeth are gone, that someone slips me a mickey and says, adieu.